This regenerative project is envisioned as a gateway to the natural world. 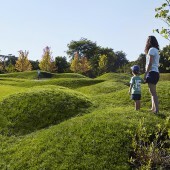 The conception of the Regenstein Learning Campus emerged from a shared concern about children’s increasingly distant relationship to nature as they are further plugged into the digital world. As the idea of getting dirty in the outdoors becomes more of an abstraction for children, we have designed this garden to highlight process, transformation, and creative discovery. 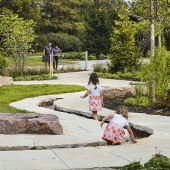 The Regenstein Learning Campus is a new environmental discovery center and nature playground at the Chicago Botanic Garden serving more than 125,000 people each year. The design immerses families and children of all ages in a variety of outdoor experiences that engenders a deeper understanding of ecological systems. Visitors encounter a variety of natural experiences and explorations as they weave through the grassy mounds, water runnels, boulders, diverse woodland plantings and willow tunnels. The design immerses families in a variety of outdoor experiences for inquiry focused learning and play, engendering a deeper understanding of ecological systems and highlighting discovery in all seasons. Diversity defines the experiences within the garden as visitors weave through grassy mounds, a water-play runnel, boulders, and willow tunnels. As an educational landscape, the garden has many engaging elements that naturally bridge the transition between play and intuitive experiential learning. The Project is in Glencoe, Illinois, USA. It began in 2012 and was finished in 2016. The campus links the Grunsfeld Growing Garden, an herb and culinary garden, and the Kleinman Family Cove, an aquatics learning center for families and children. Together these learning environments now read as one experience providing a rich and highly programmed learning center for the Chicago Botanic Garden; one that is as much about touching, smelling and feeling as it is about visual beauty. Sustainability drove the design of the runnels, the stone bridges, the fire pit and the upper paved terrace. Local and regional materials from the Midwest were sourced for the play runnel, providing a cooling oasis during the summer months. 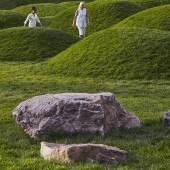 Regionally sourced boulders offer moments of discovery throughout the landscape. Rain gardens in the Northwest corner of the garden provide additional opportunities for discovery and learning while addressing important stormwater management issues. 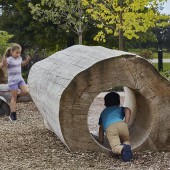 Reclaimed logs were carved to create moments of play for children to crawl and hide and seek. Regionally sourced boulders offer moments of discovery throughout the landscape. Rain gardens in the Northwest corner of the garden provide additional opportunities for discovery and learning while addressing important stormwater management issues. Discovery and imagination are emphasized in the vision of this design, offering visitors fertile ground for the expansion of the mind and body. The conception of the Campus emerged from a concern about the relationship of children to nature as they are further plugged into the digital world. This garden is an important first step in providing a place of learning by doing as it encourages direction engagement with the natural cycles of nature and reconnects our youth to the ecological world. The hardest creative challenge for the Regenstein Learning Campus was managing the design of the grading. The site, at its lowest point, was prone to flooding and so the site strategies had to include mitigation of this condition. Opening more than 40 years ago, the Chicago Botanic Garden has 27 gardens and four natural areas, uniquely situated on 385 acres on and around nine islands, with six miles of lake shoreline. 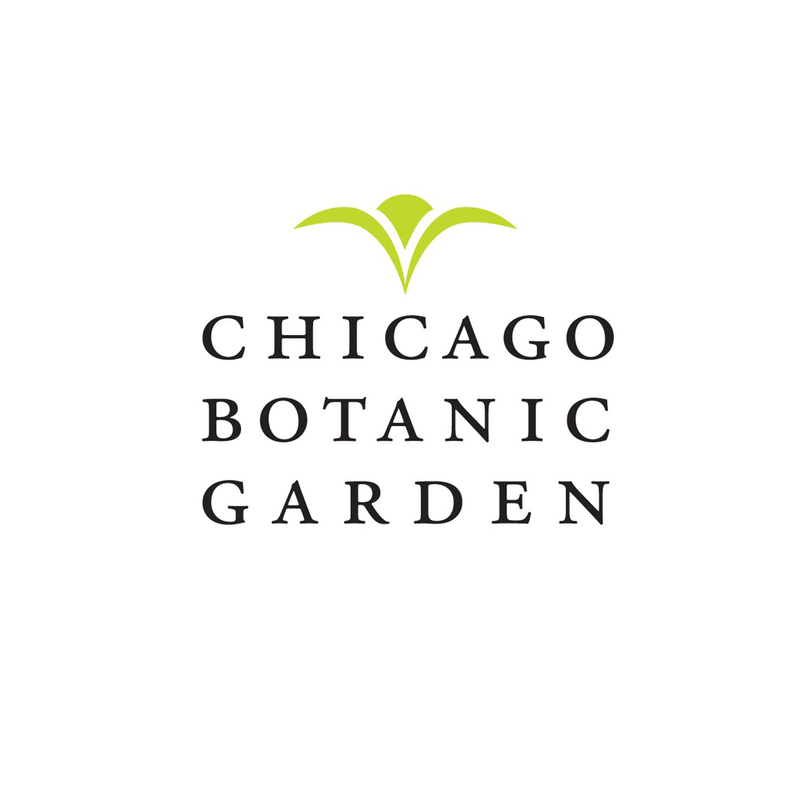 The Chicago Botanic Garden has one of the largest memberships of any U.S. botanic garden. People of all ages, interests, and abilities participate in programs, take classes, and stroll the grounds year-round. Regenstein Learning Campus Botanic Garden by Mikyoung Kim is a Nominee in Landscape Planning and Garden Design Category. · The profile and other works by Mikyoung Kim is also kept secret. This information will also be available later. Regenstein Learning Campus Botanic Garden by Mikyoung Kim is Winner in Landscape Planning and Garden Design Category, 2017 - 2018. · Press Members: Login or Register to request an exclusive interview with Mikyoung Kim. · Click here to view the profile and other works by Mikyoung Kim. Did you like Mikyoung Kim's Landscape Planning Design? Did you like Regenstein Learning Campus Botanic Garden? Help us create a global awareness for good landscape planning design worldwide. Show your support for Mikyoung Kim, the creator of great landscape planning design by gifting them a nomination ticket so that we could promote more of their great landscape planning designs.